Chaamp Kabab recipe by Nazia Nazar at PakiRecipes.com. 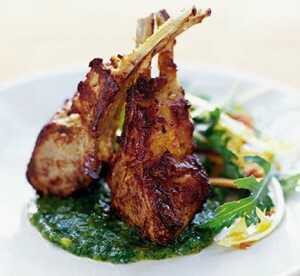 A tasty recipe of pan fry champs or lamb chops. Ready in no time and very delicious. Wash the chops and pierce them all over with a fork, parboil and drain them. Rub the ginger / garlic , salt and pepper on the chops. Then spread the onions on top and set aside for 15 minutes. Beat the eggs until thay are fluffy and then pour over the chops. Sprinkle the vinegar on top. Heat the oil and fry until they are goldenbrown. Serve hot with your choice of sauce or main dish.